The connection of Assam with Sikhs dates back to Guru Nanak’s visit to Assam. Assam is a northeastern state of India with its capital at Dispur in the Guwahati city. Located south of the eastern Himalayas, Assam comprises the Brahmaputra and the Barak river valleys and the Karbi Anglong and the North Cachar Hills with an area of 30,285 square miles (78,438 km²). Assam is surrounded by the other six of the Seven Sister States: Arunachal Pradesh, Nagaland, Manipur, Mizoram, Tripura and Meghalaya. These states are connected to the rest of India via a narrow strip in West Bengal called the Siliguri Corridor or "Chicken's Neck". Assam also shares international borders with Bhutan and Bangladesh; and cultures, peoples and climate with South-East Asia—important elements in India’s Look East policy. Assam became a part of India after the British occupied the region following the Treaty of Yandaboo of 1826. It is known for Assam tea, large and old petroleum resources, Assam silk, for its rich biodiversity and Kaziranga and Manas are both World Heritage Sites. A land of high rainfall, Assam is endowed with lush greenery and the mighty river Brahmaputra, whose tributaries and oxbow lakes provide the region with a unique hydro-geomorphic and aesthetic environment. Two later dynasties, the Ahoms and the Koch left larger impacts. The Ahoms, a Tai group, ruled Assam for nearly 600 years (1228–1826) and the Koch, a Tibeto-Burmese, established sovereignty in c.1510 AD. The Koch kingdom in western Assam and present North Bengal was at its zenith in the early reign of Naranarayana (c.1540-1587 AD). It split into two in c.1581 AD, the western part as a Moghul vassal and the eastern as an Ahom satellite state. Since c 13th A.D., the nerve centre of Ahom polity was upper Assam; the kingdom was gradually extended till Karatoya river in the c.17th-18th A.D. It was at its zenith during the reign of Sukhrungpha or Sworgodeu Rudra Simha (c.1696-1714 AD). Among other dynasties, the Chutiyas ruled the north-eastern Assam and parts of present Arunachal Pradesh and the Kacharis ruled from Dikhow river to central and southern Assam. With expansion of Ahom kingdom, by c.1520A.D. the Chutiya areas were annexed and since c.1536 AD Kacharis remained only in Cachar and North Cachar more as an Ahom ally then a competing force. Despite numerous invasions, mostly by the Muslim rulers, no western power ruled Assam until the arrival of the British. The most successful invader Mir Jumla, a governor of Aurangzeb, briefly occupied Garhgaon (c.1662–63 AD) the then capital, but found it difficult to control people making guerrilla attacks on his forces, forcing them to leave. The decisive victory of the Assamese led by the great general Lachit Borphukan on the Mughals then under command of Raja Ram Singha at Saraighat (1671) has almost ended Mughal ambitions. Mughals were finally expelled in c.1682 AD from lower Assam. Ancient Assam known as Kamarupa was ruled by powerful dynasties: the Varmanas (c.350-650 AD), the Salstambhas (Xalostombho, c.655-900 AD) and the Kamarupa-Palas (c.900-1100 AD). In the reign of the Varman king, Bhaskaravarman (c.600–650 AD), the Chinese traveler Xuan Zang visited the region and recorded his travels. Later, after weakening and disintegration (after the Kamarupa-Palas), the Kamarupa tradition was somewhat extended till c.1255 AD by the Lunar I (c.1120-1185 AD) and Lunar II (c.1155-1255 AD) dynasties. Cultural reminiscences of its past are ancient monuments which include a ferocious lion excavated in Madan Kamdev close to Baihata Cariali in Assam representing the powerful Kamarupa-Palas (c. 9th-10th century AD) and Rang Ghar, a pavilion built by Pramatta Singha (also Sunenpha; 1744–1751) in Ahom capital Rongpur, now Sibsagar; the Rang Ghar is one of the earliest pavilions of outdoor stadia in South Asia. The connection of Assam with Sikhs dates back to Guru Nanak’s visit to Assam. Kamroop, the interior district of Assam and Noor Shah the famous witch have been mentioned in Janamskhis; the Sikh historical chronicles. During Guru Nanak’s visit to the state, Noor Shah the witch enticed Mardana and converted him into a lamb. Guru Nanak explained her the importance of real spell in God’s name recitation and the real deed to serve the humanity. She and her companions became followers of Guru Nanak. The new states of Nagaland, Meghalaya and Mizoram formed in the 1960-70s. From Shillong, the capital of Assam was shifted to Dispur, now a part of Guwahati. After the Indo-China war in 1962, Arunachal Pradesh was also separated out. All these states were part of Assam during Guru nanak’s visit. During Guru Nanak’s visit, he is stated to have visited, Lumpung, Tawang, Menchukha, Tato, Walong, Lohit Lake, Tinshukhia, Dibrugarh, Golaghat and Gwahati. Gurdwaras at Golaghat and Menchukha remind us of his visit to Assam. With his religion, being a proselytizing one, it was but natural that he had footed through the dense forest tracts of Assam and met various tribes in the course of his journey. Guru Nanak must have diffused his message - the message of love and unity and gospel of universal tolerance - amongst the populace. After Guru Nanak, the Ninth Guru, Tegh Bahadur, was the next to come to Assam. He came along with the Mughal forces commanded by the General Raja Ram Singh in 1670, sent by Emperor Aurangzeb to launch a full scale invasion of Assam to avenge an earlier defeat at the hands of Assamese. Guru Tegh Bahadur the Ninth Guru of Sikhs visited along with Raja Ram Singh’s forces at later’s request as General Ram Singh may have believed that the presence of a Guru in the Mughal ranks might serve as a moral booster to them in their fight against the Assamese. Guru Tegh Bahadur and Ram Singh reached Rangamati and then came to Dhubri Guru Tegh Bahadur helped Raja Ram Singh the Mughal General who had attacked Assam and the Ahom Ruler to arrive at an amicable settlement. As a mark of respect to the Guru, the two forces joined together and raised a platform at Dhubri. where the first gurudwara was established by the Mughal soldiers as a memorial of the Guru. The third major connection is that of Raja Ratan Rai, who presented an elephant, a large tent known as tambol and a baaj to Guru Gobind Singh. The fourth important connection is the army of 500 Sikhs sent by Maharaja Ranjit Singh to help the Ahom King, who settled in Assam and married locals and raised families. These families are now known as the Assamese Sikhs. According to a tradition of these Assamese Sikhs their forefathers came from Punjab on an invitation from the Ahom king to defend Assamese liberty against the Burmese. King Viswanarayan Singh (Chandra Kanta Singha) of the Ahom tribe then deposed ruler of Assam, sought Maharaja Ranjit Singh's help to defeat the Burmese army. It was around that time when 500 soldiers were sent under the leadership of General Chetan Singh (local known and revered as General Chaitnya Singh). The Ahom ruler, Chandra Kanta Singha, built up defenses at Hadirachaki with armies under the command of the Sikh General Chetan Singh (Chaaitanya Singh), the Ahom general Charu, the Muslim General Mirdaulla and the Assamese General Krishnaram. They crossed the Brahmaputra and Kalang rivers and reached Chaparmukh. General Chetan Singh, along with his army, fought gallantly against the Burmese in a pitched engagement at Hadirachaki, and laid down their lives and laid down his life at the battle of Hadirachaki (1820-1822).for the cause of Assam. According to local tradition, Chaitanya Singh, on the eve of the battle, said to the Ahom King, "Moharaj, I shall lay down my life along with my army for upholding your cause." True to his words Chaitanya kept his promise. Assam remembers him with gratitude and honor even to this day. This poignant saga has been mentioned in the monumental novel ‘Monomati’ written by Rajani Kanta Bordoloi, a leading novelist of repute. These Assamese Sikhs began to settle permanently only after the battle of Hadirachaki. After defeating the Burmese, those who survived did not return to the Punjab, got settled there and have now been in Assam for two hundred years or more. They married Assamese women and increasingly identified themselves as Assamese Sikhs. They regard themselves distinctly as Assamese Sikhs and do not generally belong to the Punjabi Sikh community of Assam many of who are landowners or skilled laborers. The two Punjabi Sikh communities associate themselves with distinct organizations and maintain separate identities. History of settlement: The settlement of this community in Assam can be traced back to the third Burmese attack. Present settlements: General Chetan Singh died in the war but his wife who is known as 'Mataji' survived. Following the decade at Hadirachaki and the loss of her dear husband in the thick of battle, Chaitanya’s widowed consort, accompanied by the remainder of the Sikh forces, proceeded upstream by the Brahmaputra and via Kajalimukh, passed through the Kapili river and the Titiamari Khuti, and encamped at Chaparmukh in the Nawgaon district. They carried with them a few copies of religious scriptures, two cannons and a number of swords (Kirpans). These articles have since been carefully preserved in the Gurudwara Mataji, Chaparmukh Singh Gaon, Nowgaon (Assam). Gurudwara Mataji is the second historical Gurudwara in Assam. The Sikhs first settled at Chaparmukh and later on they moved to Barkola, Hatipara, Lanka (all in Nowgaon district of Assam). The largest numbers of Assamese Sikh families (about 150 families) now live at Borkola. Most of the Sikhs of Assam are descendents of Mataji and considered as upper class Sikhs for their pure lineage. There is yet another branch of Assamese Sikhs with different lineage. One Ram Singh who went to Assam in the year 1823 got married to an Assamese girl and settled in Borkola. It is popularly believed that Sardar Ram Singh was the first Sikh Sardar who came to Borkola to reside. The Population of Assamese Sikhs in the State is at present about 10,000. Physical features: There is also a sharp break in their physical structure. The Punjabi Sikhs are well-built while the Assamese Sikhs have slighter physiques. The Assamese Sikhs are mainly rice eaters while the Punjabi Sikhs primarily eat wheat. Assamese Sikhs are often closer to local Hindu rituals relative to the Punjabi Sikhs. Their features have become Mangoloid due to cross marriages and their beard is sparse. They however wear turbans, though not exactly the same way as do the Sikhs in Punjab do. Culture and Traditions: The companions whom Chetan Singh had left behind subsequently married Assamese women and fused with Assamese life and culture. The new generation of Assamese is truly wedded to Assamese culture and language though they maintain their Sikh identity rigidly and do not have knowledge of Punjabi in general. Their names too have Assamese accent. Displaced from their place of origin centuries ago, this community does not follow Punjabi traditions or wedded to Punjabi. About 10,000 Assamese Sikhs are mainly concentrated in Nowgaon district. They feel proud of their Sikh background and maintain all rituals including going to gurdwara regularly and performing marriages according to Sikh traditions. "Our forefathers came to Assam centuries ago to rescue the Assamese people from foreign invasion and that makes us feel proud. As far as our religion is concerned, we have been following it with utmost devotion," says one of the Assamese Sikhs. Ask any of the families in Borkola and you are likely to hear this line over and over again: "When Giani Zail Singh visited Borkola in 1975, he was surprised at the way we are following the Guru Granth Sahib." They have not assimilated themselves into the Assamese society to a large extent as well as they have remained loyal to their religion. They celebrate both Mag Bihu and Lohri, which fall on the same day — January 13. With equal enthusiasm they celebrate both Gurpurab and Shankar Dev's tithi as well as participate in Bohag Bihu and Durga Puja, the two most widely celebrated festivals of Assam. Thus their culture can be said as an amalgam of Sikh and Assamese culture. The Punjabi Sikhs have not assimilated with Assamese Sikhs and maintain differences due to the two differing cultures and a superiority feeling among the Punjabi Sikhs; which has unnecessarily created barriers. "We have never felt that we are not a part of the Assamese society and at the same time we have been faithful to our religion," says S. K. Singh, president of the Assam Sikh Association. "But it hurts us when we are called "duplicate Sikhs" or "second class Sikhs" by our counterparts in Punjab," he adds. "In fact, in some respects, we are stauncher than the Punjabi Sikhs," says Jaswant Kaur. "We may not speak the language but we follow our religious book very seriously. Most of us are Amritdharis, as it is our custom to partake of Amrit before we get married," she adds. And they are proud of their heritage too. Visit any of the families in Borkola and you are likely to hear this line over and over again: "When Giani Zail Singh visited Borkola in 1975, he was surprised at the way we are following the Guru Granth Sahib." The Assamese Sikhs speak Assamese and marry local girls from their own communities (generally Punjabi-speaking Sikhs do not give their daughters to them). The process of assimilation was so decisive; that they embraced their land of occupation as their homeland. They played a significant role in their efforts to defend and serve the cause of the State at various levels from time to time. These Sikhs don’t feel nostalgic about being away from Punjab, its culture and its people. "We are Assamese who are following the Sikh religion. We have adopted this place as our own, as we have been living here for generations." You may not be greeted with a glass of water or soft drink as per Punjabi culture but with a sarai containing betel nut and paan — the traditional offering made by the Assamese. Even the lady of the house looks like just any other Assamese married women — adorned with sindoor and clad in mekhla – chaddar, the traditional Assamese dress — till your eyes rest on the tiny Kirpan tucked under the chaddar. Of course, these generalizations do not hold for all the Punjabi-speaking Sikhs. Those who have long been here say those who settled here during the twentieth century, namely the skilled laborers who have long been associated with the local flourishing technical aspects of the tea industry, have become closer to Assamese culture. They maintain separate gurdwaras in Jorhat, a place situated nearly two hundred miles from Guwahati, the capital of Assam. The religious Practices: It would not be out of place to mention here that under the auspices of the Assamese Sikh Association, and able leadership of Dhyan Singh, President of the Association, the work of renovation of Gurudwara Mataji has been taken up with kind donations from gurpremi sadh sangat. The occasion of Guru Tegh Bahadur’s visit Assam is celebrated every year at this historical Shrine. Although the Assamese Sikhs have their own gurudwaras, they have been maintaining fraternal cohesion and amity with the people of other religious persuasions in their neighborhoods. Their participation in all Assamese festivals and institutions like Bihu (the most important and popular festivals in Assam, signaling the harvest and marking the advent of spring and autumn), the birth and death anniversaries of Shankar Dev and Madhav Dev, Rang Utsav, weddings and other festivals speak eloquently of their integrated life with the mainstream of the Assamese people. Mataji Gurdwara in Borkola village is the most popular Sikh gurdwara in this region. The site where a gurdwara now stands in Dhubri district was visited by Guru Teg Bahadur. 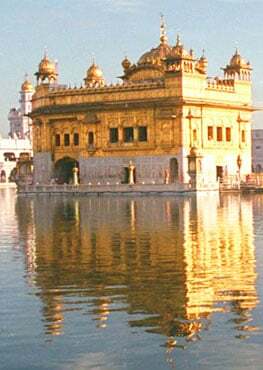 However, the ultimate pilgrimage for them still is the Golden Temple in Amritsar. Sri Himadri Banerjee writes, “I came across at least three distinct trends among Assamese Sikhs. 1. A sizable section of them nowadays show their keenness to learn more about the Punjabi Sikh tradition, e.g. learning to read Punjabi in order to gain direct access to the sacred text. This leaning toward Punjabiyat is increasingly coming to the forefront. Earlier this was not that popular, particularly among those who have long left their ancestral villages and have settled in distant urban areas of Assam and beyond. Perhaps they unconsciously claim a superior status relative to their Assamese Sikh forefathers. Recently, this point was repeatedly articulated by residents of Chaparmukh village. It creates a sharp differentiation within the community. Their readiness to follow the Punjabi Sikh model reminds us of the Sanskritisation model suggested by Professor Srinivas nearly four decades ago. The rich marry their daughters to Bihari Sikhs. The rest marry their daughters locally. 2. A small section - albeit part of what appears to be a growing trend - does not keep Kes [unshorn hair] subsequent to marriage with Assamese women and identify themselves as Assamese rather than Assamese Sikhs. 3. The majority, however, identifies themselves as Assamese Sikhs and are not all that attached to the Punjabi Sikh tradition. They claim to be sons of the soil (Assam) and, therefore, do not feel much affinity toward the Punjab. 1. Granting the Status of Minority and Scheduled Caste, which the community deserves badly for upliftment of their status socially and economically. 2. Financial support to educate the new generations of Assamese Sikhs on Sikhism in Assamese language. 3. Organization of Excursion tours to Punjab and other parts of the Country for the Assamese Sikhs so that they learn and identify themselves with the history and teachings of Sikhism. 4. To teach Gurmukhi language to Assamese Sikhs so that they are able to read and write the language in which the religious scriptures are written. 5. Maintenance of the historical gurdwaras of Assam, which could be important tourist destination for the Sikhs living outside Assam. Professions and Progress: By and large an agrarian society, the new generation of Assamese Sikhs has come out of its shell to take up responsible positions in government and private sector. They are now teachers, businessmen, and officers in the civil services. Though now they have begun picking up jobs in other parts of the state, they are still plagued by feelings of insecurity. And this is the reason behind the formation of the Assam Sikh Association. "We are the smallest minority community in the region but we have not been granted minority status so far," says S. K. Singh. "The Association is going to demand minority status and along with that representation in local bodies and state assembly," he adds. Till they get this status, Assamese Sikhs have a tough fight ahead to assimilate into the local society and also to prove to the Punjabi Sikhs that they too are respectable Sikhs. Since now the fourth connection with Sikhs in Punjab is the Prime Minister Manmohan Singh who is the MP from Assam for both of his tenures; these Sikhs look towards him to do something memorable.